Easily dress up dinner place settings with paper placemats from Creative Converting. Our Touch of Color party goods line offers you a rainbow of choices. Choose from a full spectrum of colors to mix, match and mingle with other solids or as accents to our themed ensembles. Whether you're planning an intimate dinner, a family gathering, or a huge party, you can trust Creative Converting for high quality, consistent color matching and attention to detail. 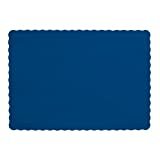 Interested in the Creative Converting 863278B Paper Scalloped Edges Placemats 10" x 14" Navy? Is the price too high? You can easily price watch this product and we'll notify you when the price reaches your target.